I hope everyone had a great weekend! I was pretty busy as usual. I attended the 13th Annual Quincy ArtsFest and had a nice time! (I posted a few pictures on my Facebook page if you’re interested:) I worked on the felt foundation of my beaded self portrait; I started beading a new cat pin for my Etsy shop (which I will show you soon); and I started working on a new freeform beaded necklace! The above photo is a sneek peak of this project. 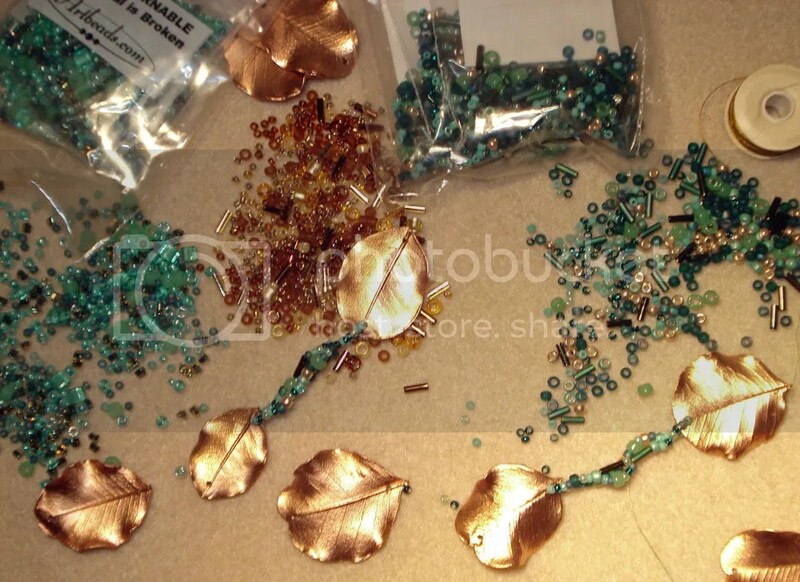 I am using copper leaves and new Toho seed bead mixes from Artbeads.com. This piece is inspired by the Colors of Fall, which is just around the corner! What did you work on over the weekend? >I love the colours of fall. And being busy is always good!